And he was backed. 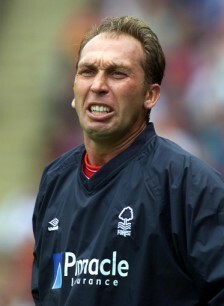 Backed like no other manager probably has been at Forest. We had quite a bit of money to burn following the sales of a few of the las Premier League team. 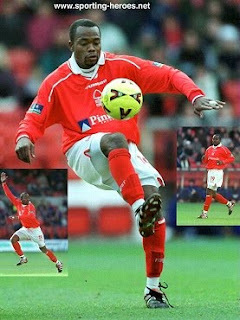 Stone had left for a big fee before the end of the season and very notably Pierre van Hooijdonk. He went about making signings. Riccardo Scimeca being the first high profile one, bringing the former England Under21 defender from Aston Villa for a princely £2.5million. He followed this u with Gianluca Petrachi, Salvatore Matrecano and Moreno Mannini from the Italian Leagues he knew so well. These 3 names live long in Forest fans memories as being unmitigated disasters. Each one barely lasting out 3 months before being consigned to the scrap heap. They had cost us around £5million for this hapless trio. None of these players would ever amount to much else in their career, which illustrates how crap they were. Given a remit to get us promotion we managed to finished 14th in his first season. I at the time missed much of this season as I was at university, I did make it to quite a few games, especially away games, one such one was a horrendous 3-0 defeat away at Tranmere in what is possibly the worst performance I have ever seen a Forest side putout. It also felt like every time I came home from Uni we had more players I never recognised such was the passion of Platt for chopping and changing. A roll call of the average and the never could be's. I had particular dislike of our signing of Mikkel Beck, coming a week after I had derided him to friends whilst watching Derby in some match on Sky. Telling everyone that he was without doubt the worst player I had ever seen (anyone else remember him being subbed back off 10 mins after coming for Boro at Forest for being THAT bad? )I couldn't believe it when informed we had signed him, thinking it to be a joke, but no we did,albeit a brief period, he even scored. We had also spent big on a number of other names, Stern John and Jim Brennan in particular chasing promotion, with spiralling wages. This in turn led to the fact we were in trouble financially, culminating in us pulling out of spending a paltry £300k on Robbie Blake as we couldn't afford it. Money was drying up, and we didn't seem closer to the Premier League. Platt increasingly seemed clueless but received board backing. My refection on it is that I don't think there was the same clamour to see him ousted as there was with the likes of Megson and a largely successful Calderwood. However he started the rot by spending extremely badly. Our second season was one of improvement, we did finish higher, but there was not much hope of continuing this as due to the parlous condition of the finances, made worse by the collapse of ITV digital, and the money to have come from that deal disappearing, we were consigned to shipping out people. We had to let John go on the cheap later as it turned out a deal was in place to pay a £250k fee if he scored more than 15 goals in a season. What kind of deal was that??! !A star striker signed but with add ons for what is an average number of goals for a striker? Ridiculous. More so was the signing of Gary Jones. I still think he might be one of the most pointless signings we ever made. He was useless. We then despite all this signed David Johnson, which although he turned out to be a good acquisition in later years, was at the time a risk, and at first he took time to settle. One highpoint was the brief loan of Ben Olsen before his injury,which was a real shame. But by and large his reign was truly a dark day for the club,leading it to the stage where we were on our knees. Fans had started to turn and when Sven Goran Eriksson, Platts mentor at Sampdoria came calling anting him as the U-21 boss I think every Forest fan was relieved that we had gotten rid of the walking disaster zone. His subsequent results with England confirmed he was clueless. And it speaks volumes that has never managed another club. OK, shortly after we bounced back and made the playoffs but the legacy of his spending meant that young players had to be sold off. Jenas in particular being sold to basically let the club survive. Dawson and Reid was money we couldn't turn down,and unable to spent to replace we dropped down to League One. OK,he never made the wonderful faux pas like Kinnear had by calling fans idiots and moaning about the clubs history, or like Megson talking about sinister forces at work (what the hell was that all about?) But his consistently bad record puts him ahead of managers who over saw relegation to the clubs lowest ebb in in terms of hatred from Forest fans.